From the author of Stay! 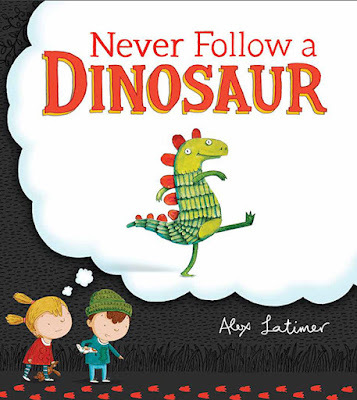 A Top Dog Story and Lion vs. Rabbit, Never Follow a Dinosaur is a fun and imaginative mystery sure to entertain all ages. Great for helping children draw conclusions or introducing deductive reasoning, readers will want to find out what new idea the siblings have about this mysterious dinosaur as the story progresses. With Latimer's quirky illustrations and a surprise ending, little ones will be laughing out loud and wanting to read this picture book again! Track down a copy of Never Follow a Dinosaur on September 1st! Looking for fun and creative ways to use this book with children? Check out some dinosaur-related pins on our "Storytime Snack & Crafts" Pinterest board.